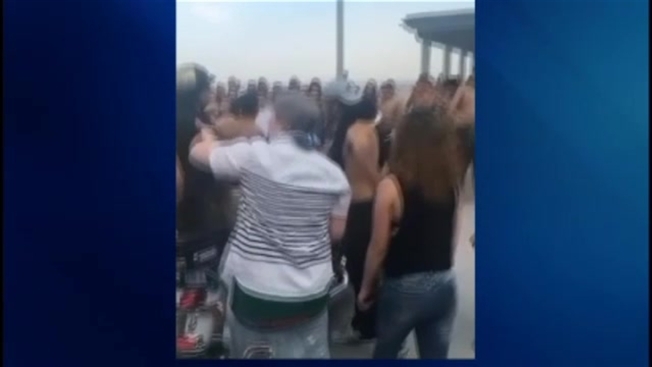 One police officer was injured and a teen arrested following a series of large fights involving hundreds of people at New Hampshire's Hampton Beach last week. Police were initially called to a report of a large fight at the Hampton Beach Pavilion around 6:30 p.m. on May 25. Police found a group fighting and arrested the person they determined to be the aggressor - Julian Cruz, 18, of Manchester - for disorderly conduct and resisting arrest. He had to be Tasered during the course of the arrest. He was released on bail and is scheduled to be arraigned on July 12. As the officer was taking Cruz into custody, a large group of about 300 people surrounded the officer and began chanting at him. A number of other large groups remained in the area following the initial disturbance, and police were forced to respond to the pavilion again for a potential riot. Hundreds of people were there, and several fights broke out, with some people throwing objects at police. New Hampshire State Police and Seabrook Police were called in to assist Hampton Police in clearing the groups from the area. One Hampton police officer was transported by Hampton Fire to Portsmouth Hospital with minor injuries. Additional staff were called in from state police and other neighboring departments to help patrol the beach throughout Memorial Day weekend. They made several sweeps of the beach area, removing people who had open containers of alcohol or who were acting in a disorderly fashion. Anyone with information on the May 25 incident or any other similar incidents at the beach are urged to call Hampton Police at 603-929-4444.